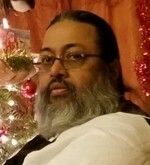 Hector Clark, 52, of Las Cruces departed with the comfort of his family by his side on January 29, 2019. Hector was a loved, well respected, and hard worker for the city of Las Cruces, Parks and Recreation department where he earned his retirement. He had many hobbies and interests; however, his biggest passion was anything to do with the Pittsburgh Steelers. Hector was born December 3, 1966 to Daniel J. Clark and Alice P. Clark, whom he has preceded in death, along with his brother Daniel Clark, Jr.
Those left to mourn Hector’s passing include his companion, Myrna Diaz, his sisters, Lori Dominguez spouse Rafael Dominguez, Jr., Terry Huey spouse Fred Huey, and his ever-faithful Chihuahua Chiquita. Hector had many nieces and nephews such as Rafael Dominguez III spouse Brandi Dominguez, John Clark, Annette Dominguez companion Eugene Ramirez, Joey Dominguez spouse Amber Dominguez, Simon Dominguez, Jr. companion Maribel Nunez, Ryan Clark, Steven Dominguez spouse Lluvia Salazar, Meagan Clark, Jasmine Clark, and Tommy Clark. Services for Hector will be held at 1:00 pm. Monday, February 11, 2019 at St. Genevieve’s Catholic Church. Pallbearers are Rafael Dominguez III, Joey Dominguez, Steven Dominguez, and Eugene Ramirez. Honorary pallbearers Tommy Clark, Maximus Dominguez, Israel Ramirez, Meridius Dominguez, and Armando Dominguez. A reception in celebration of Hector’s life will be held for friends and family following his services. To send flowers to the family of Hector Clark, please visit our Heartfelt Sympathies Store.